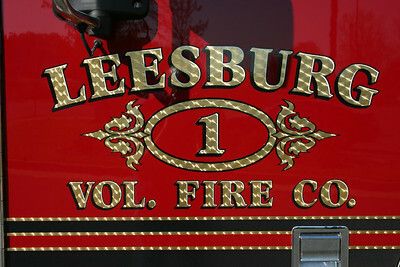 Leesburg Volunteer Fire Company - Stations 1 and 20. 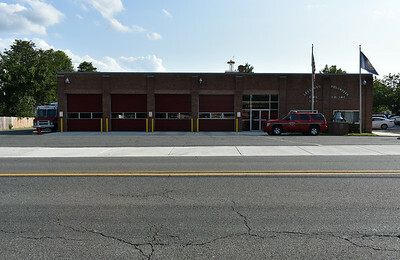 Leesburg, Virginia Fire Station 1 in Loudoun County. 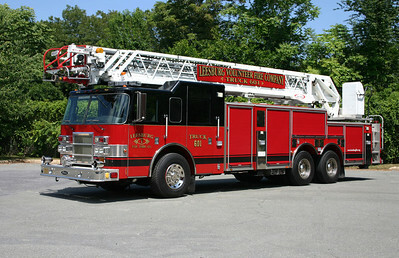 One of two 2007 Seagrave TB70kk 2000/750/50/30 pumpers. This is Wagon 601 (now Engine 601) and was photographed at the 2008 Apple Blossom Festival firefighters parade in Winchester. Tanker 601, a 2009 Pierce Arrow XT 2000/2500/50/150. Foam primarily for coverage at Leesburg Airport. This photograph appeared in the November/December 2009 edition of Fire Apparatus Journal. Still owned by Leesburg is this beautiful 1929 Seagrave 500/125. 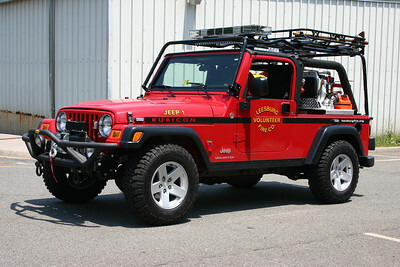 This was the first custom built fire truck in Loudoun County. It has been completely restored. 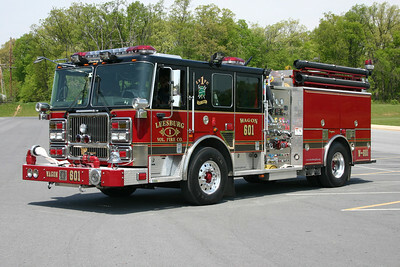 In 2013, Leesburg Truck 601 had some revisions made. The wheel covers were removed and the wheels painted red. A black stripe was painted on the outer section of each wheel and the wheel nuts were painted black with the tips red. A Roto-Ray warning light had also been added. Truck 601 is a 2012 Pierce Dash 105' aerial that was purchased in 2011 from Brindlee Mountain, a used fire apparatus dealer. The Pierce originally served Ormond Beach, Florida, and prior to that, was a Pierce demonstrator. 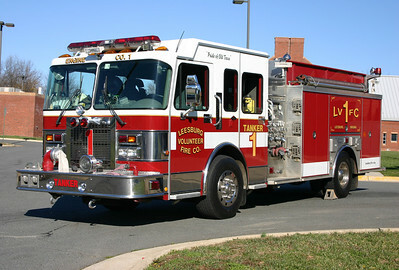 Truck 601 was purchased in 2011. 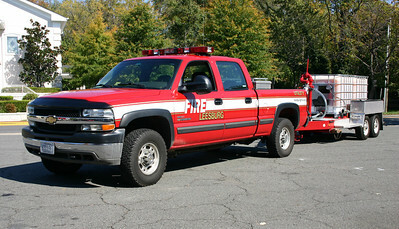 It runs as Leesburg's reserve truck to back up the Seagrave tiller, which changed its radio designation to Truck 620. 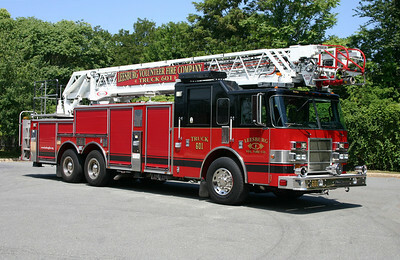 The Pierce ladder truck is a 2002 Pierce Dash equipped with a 105' rear mount ladder. This ladder truck was originally a Pierce demonstrator ladder truck, later to be purchased by Ormond Beach, Florida. 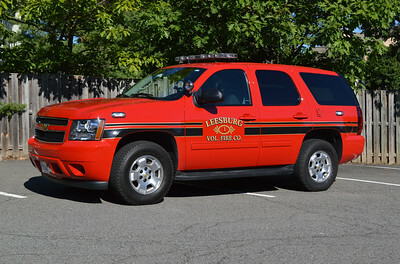 Leesburg purchased it from Brindlee Mountain, a used fire truck broker. Brindlee Mountain had the truck painted for Leesburg black over red and did other work prior to Leesburg receiving the ladder truck in July of 2011. The officer side of Truck 601, a 2002 Pierce Dash 105'. 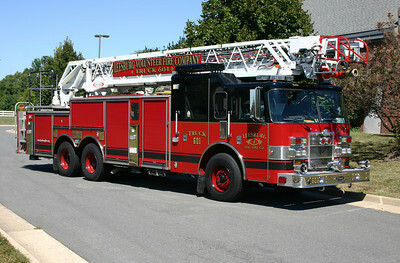 Photographs of Truck 601 were taken at Loudoun County High School in late July of 2011. Jeep 601 is a 2006 Jeep Wrangler Rubicon/RKO. 25/60/10. Command 601 from Leesburg is this 2013 Chevrolet Tahoe/Fast Lane. A group photo of Command 601 and Command 620 taken at Leesburg Fire Station 1. Utility 601, a 2002 Chevrolet 2500 pick up, pulling Foam 1, a 2004 National Foam Kidde equipped with two 275 gallon foam tanks. The foam trailer was disposed of several years ago with the delivery of Tanker 601. A near twin to Engine 620, Engine 601 is a 2007 Seagrave TB70kk 2000/750/50/30. 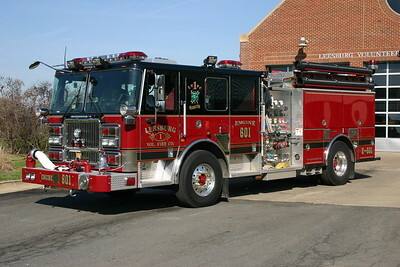 E601 was photographed on the front ramp of Fire Station 20 in Leesburg. For sale in early 2017. 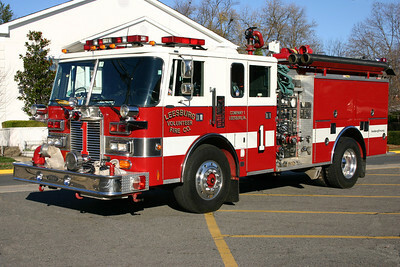 Former Engine 1, a 2000 Spartan/Luverne, 1500/1250, sn- 11053. One of two identical 2000 Spartan Gladiator/Luverne's 1500/1250. They operated originally as Engine 1 and Tanker 1. Both sold in 2009, one to a department in Wisconsin and another in Alabama. Old Wagon 1, a 1988 Pierce Lance 1500/750. 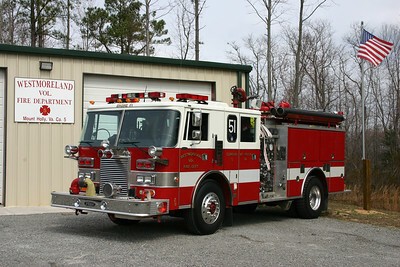 Now in service at the Westmoreland VFD in Montross, VA. (see next photograph). Sold in December of 2007. 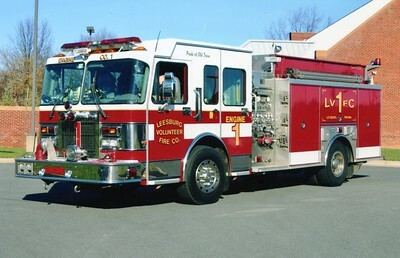 Leesburg's old 1988 Pierce Lance now runs as Engine 51 for the Westmoreland VFD Mt. Holly, Virginia substation. Now privately owned -former Engine 1 is a 1973 Seagrave PB24056 with a 1250/750. 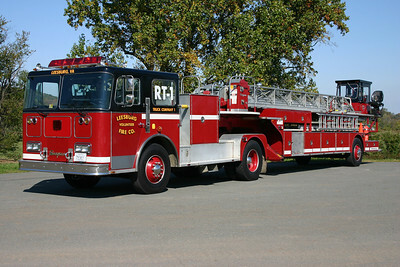 Rehabbed by Seagrave in 1988, which included additional compartments. 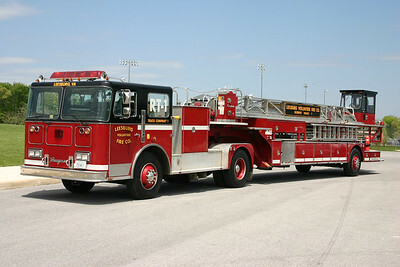 Removed from service in 2009 and sold to a Leesburg VFC member. This photograph was taken at the 2010 Apple Blossom firefighters parade in Winchester, Virginia. One of the first rescue engine's in Northern Virginia. 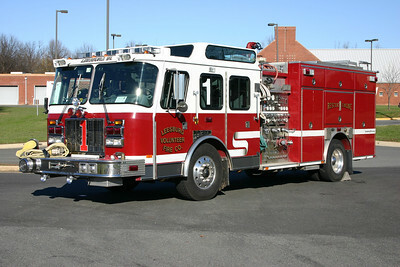 Rescue Engine 1 was a 1995 E-One Protector 1500/500. It was sold in 2007. 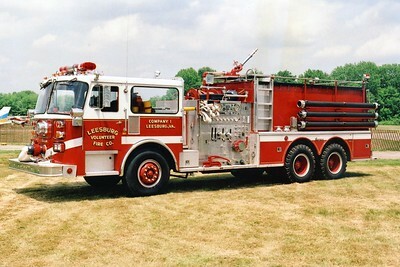 Leesburg's former Tanker 1, a 1981 Seagrave HB, 1250/2000. Sold in 2002 to Spokane County District #3 (Cheney, Washington). 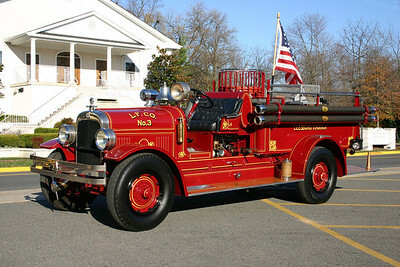 The 1988 Seagrave as photographed at the annual Apple Blossom Festival firefighters parade in Winchester, VA in 2007. By this time, the ladder board sign was added. When Leesburg was preparing for the delivery of their new 2007 Seagrave 100' tiller, they purchased this 1988 Seagrave JT07DB 100' tiller as a training truck. Note the training seat at the tillerman's position (helmet required when riding the training seat). 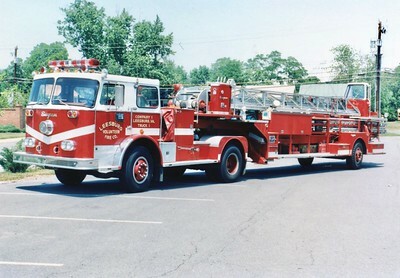 This 1988 Seagrave was originally ordered by Richmond, VA where it ran as Ladder 2. It was then sold to Washington D.C. where it ran as a front line truck and a reserve. It was sold to an individual in Georgia, and Leesburg purchased it from him. 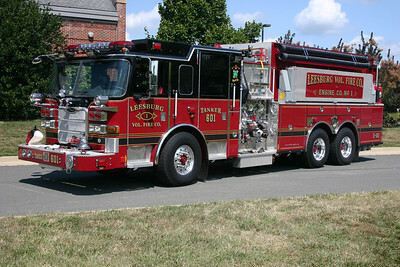 Leesburg members rehabed it in 2006 with the addition of the black roof. It was sold in 2009 to a company in Central Tennessee that delivers training to fire departments in that area. 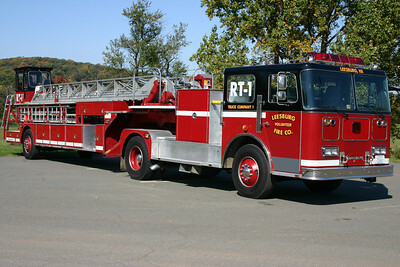 Reserve Truck 1's officer side. 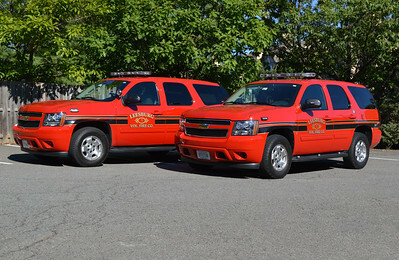 The photograph's of Reserve Truck 1 were taken at the Morven Park Equestrian Center in Leesburg. 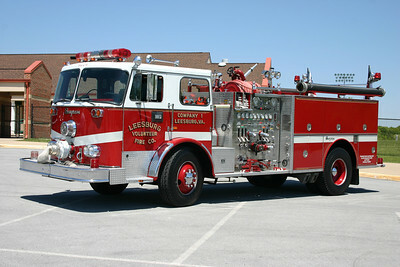 Former Truck 1 from Leesburg, a 1973 Seagrave PT, 100'. Sold to Baltimore City in 1992. Scrapped in 2000.